Dreams can come true," says Keith Ramirez, President and CEO of Inkjetmadness.com, Inc. a leading online inkjet and toner cartridge retailer. In 2003, while struggling to support his family, Keith worked 60-hour weeks and worked two jobs to manage enough funds to begin an online printer ink company. While it seemed absolutely impossible at times, he managed to let perseverance and ambition carry him through tough economic times to build what is now one of the 100 fastest growing Hispanic-owned companies in the U.S. (Hispanic Business Magazine, 2010). "Life is about failing and succeeding … with each failure success becomes more and more obtainable," says Keith. A Puerto Rican-run business, has now served over half a million customers throughout the U.S. and Canada. The company is now celebrating eight years in business, an A+ Better Business Bureau rating and has recently been awarded a listing in INC 5000, Hispanic Business 500 and a prestigious listing on the Hispanic Business fastest growing 100 privately held companies. They are thriving despite a poor economy by offering consumers and business owners alike an affordable online solution for inkjet and laser toner cartridges. Their printer ink prices save the consumer up to 92% OFF the Manufacturer Suggested Retail Price (MSRP). In a time of penny pinching and cutting corners, they invests the majority of profit into further enhancing the customer’s experience through quality assurance tests, surveys, discount coupons and free shipping offers. Their goal is to become the most cost-effective solution to overpriced ink cartridges the Internet has to offer, and with the success they’ve had over the last few years, that goal is within reach. Of course after reading this article, why is Metawatch posting an article about its competitors. Simple, Metawatch has always provided superior products to it customers as well throughout this same time period and we continue to provide Canadian a superior product& service with lower prices than the competition. Compare Metawatch prices and service in Canada and we are certain you’ll be back time and time again. The Epson WorkForce 520 color inkjet multifunction printer (with print, scan, copy, and fax functions) deserves credit for breaking two inkjet stereotypes. It is not slow–in fact, it’s blazing fast. Its inks are not expensive, either–they’re impressively cheap, as is the machine’s purchase price ($130 as of July 30, 2010). Unfortunately, it was unable to kick one habit, producing mediocre text quality on plain paper. Compared with the similarly priced HP Officejet 4500 Wireless All-In-One (which costs about the same), however, the WorkForce 520 is the better deal. We found the WorkForce 520 generally easy to set up and work with. Driver setup went quickly, and the unit’s standard Wi-Fi is convenient (USB and ethernet also come standard). The two-line monochrome LCD and its interface are straightforward but feel primitive. The other controls and buttons are nicely arranged. The WorkForce 520’s features are geared to low-volume use. It offers merely a single, 100-sheet vertical rear feeder. It has no automatic duplexing (the function is manual on the PC and nonexistent on the Mac). For scanning, it provides a 30-sheet automatic document feeder and a letter-size flatbed scanner that telescopes for thicker objects. On the PC, the WorkForce 520 broke records, printing plain-text pages at 12.6 pages per minute and copies at 7.3 ppm. On the Mac, its 10.3-ppm text speed outpaced recent competitors nearly twofold; scanning speeds were also impressive. On both platforms, photo and graphics print speeds were average. Small businesses live on plain paper, however, and that’s where the WorkForce 520 falls short. On plain-paper tests at the default settings, text showed fuzzy or wavy edges and random droplet splatter–typical inkjet shortcomings. When we set the driver to ‘Fine’ quality (and slower speed), the text still exhibited artefacts, but you wouldn’t be embarrassed to show it to a client. Photos also suffered on plain paper, but on Epson’s own photo paper they smoothed out considerably and had a cheery palette. Color scanning was similarly hobbled, with the results coming out foggy and slightly faded. Other than speed, the WorkForce 520’s best attribute is its cheap ink The standard-size black costs $15.19 and lasts 550 pages–a modest 2.8 cents per page. Each color costs $11.38 and lasts 335 pages, or 3.4 cents per color, per page. The high-yield cartridges drop costs minimally to 2.4 cents for black (the 740-page cartridge costs $18.04) and 3.2 cents per color, per page (each 480-page cartridge costs $15.19). Their primary advantage is postponing the day when you must change them. Inkjet multifunction printers that cost as little as the Epson WorkForce 520 always have trade-offs. In this model’s case, you get fast output and cheap consumables–but you lose some print quality. If you think your color inkjet printer should print in black when a color cartridge is empty, you’re not alone. It’s reasonable to think your color printer can act like a monochrome printer when a color cartridge is empty, but you still have plenty of black ink. After all, your car still runs when you’re out of windshield fluid. When your printer stops printing and cries for a color cartridge, open the printer properties page and look for the black-ink-only option. You will find that there is no such option. You can choose the next best thing, grayscale printing, but the printer still cries for a color cartridge and does not allow you to print. What gives? Printers use some color ink when you print black text and black ink is used when you print color images. Also ink cools and lubricates print heads. If you could print with an empty cartridge, you might destroy a print head from the friction of printing without ink to cool and lubricate the head. Also, if your printer indicates a color is empty, there is still residual ink left at the bottom of the cartridge. The residual ink can easily clog the print head and blot ink onto pages and even permanently block the print head. You may be able to trick a printer into thinking a cartridge has ink when it does not. This trick may enable you to print in the short term, but it may also reduce the useful life of your printer in the long term. Methode Development Company, a business unit of Methode Electronics, Inc., has recently announced that its conductive inkjet printable ink can now print circuits directly onto treated polyesters. The ink, formulated for thermal and piezo inkjet systems, makes it possible for engineers to print working electrical circuits, right from their desktops – facilitating product development, prototyping, and manufacturing processes. With this technology, scale-up for high volume manufacturing can be easily achieved. Methode’s water-based #9101 ink has excellent adhesion to polyester substrates. The inkjet formulation contains conductive silver nano-particles, and does not require secondary curing or additional processing. Near full conductivity is achieved within a few minutes of printing. The ink is RoHS-compliant and negligible volatile organic compounds (VOCs) are created during printing, alleviating the need for specialized ventilation during application. The addition of treated polyester substrates significantly expands the growth potential in the flexible circuit, membrane switch, RFID and photovoltaics markets. These markets have always required an efficient and cost-effective manufacturing alternative that inkjet printing provides. The treated polyester adds to Methode’s full line of substrates – none of which require thermal processing – including coated papers and synthetic substrates, such as Teslin. A development kit is available that allows engineers to create functional electrical circuits with a thermal inkjet desktop printer. The kit includes 3 substrates, a thermal inkjet printer, a cartridge filled with the 9101 conductive ink, a printer maintenance kit, and an owner’s manual. The cartridge simply replaces the existing black cartridge on the desktop printer. The desktop print head is the same head used for industrial print systems, allowing a direct path for production scale-up. The price of the kit is $1,850 with replacement 9101 ink cartridges available. CHICAGO, Jun 24, 2010 (BUSINESS WIRE) — Methode Development Company, a business unit of Methode Electronics, Inc., announces that its conductive inkjet printable ink can now print circuits directly onto treated polyesters. The ink, formulated for thermal and piezo inkjet systems, makes it possible for engineers to print working electrical circuits, right from their desktops — facilitating product development, prototyping, and manufacturing processes. With this technology, scale-up for high volume manufacturing can be easily achieved. Methode’s water-based #9101 ink has excellent adhesion to polyester substrates. The inkjet formulation contains conductive silver nano-particles, and does not require secondary curing or additional processing. Near full conductivity is achieved within a few minutes of printing. The ink is RoHS-compliant and negligible volatile organic compounds (VOCs) are created during printing, alleviating the need for specialized ventilation during application. For more information on Methode’s inkjet printable conductive ink technology, or to place an order, please contact Emil Millas, Sales Manager, Methode Development Company: Phone: (708) 457-3222, Email: emillas@methode.com. About MDC: Methode Development Company is a leader in the materials development and application of ink technology in the microelectronics industry. Products include conductive and insulating inks, position sensing resistor elements, cermet and polymer thick film components and circuits, carbon fiber heaters, Sonicrimp(R) technology, and EMC shrinkMate. Methode Development Company is located in Chicago, IL. About Methode Electronics: Methode Electronics, Inc. /quotes/comstock/13*!mei/quotes/nls/mei (MEI 9.90, -0.01, -0.10%) is a global developer of custom engineered and application specific products and solutions with manufacturing, design and testing facilities in the United States, Mexico, Czech Republic, Germany, Malta, United Kingdom, China, Philippines, Singapore and India. We design, manufacture and market devices employing electrical, electronic, wireless, radio remote control, sensing and optical technologies to control and convey signals through sensors, interconnections and controls. Our business is managed on a segment basis, with those segments being Automotive, Interconnect, Power Products and Other. Our components are in the primary end markets of automotive, computer, information processing and networking equipment, voice and data communication systems, consumer electronics, appliances, aerospace, defense and industrial equipment industries. Further information can be found on Methode’s Web site www.methode.com. Wake Forest University have found a way to spray skin cells onto burn wounds using an inkjet-like printer for a less-painful, speedy recovery. This procedure, which is still in the early experimental stages, could be a big advance in treating burn wounds early and effectively, researchers said. "If the technology is successful, its benefits will be to quickly cover a burn wound and promote healing," said researcher Anthony Atala, M.D. researcher and director of the Wake Forest Institute for Regenerative Medicine. Printing skin cells onto a patient’s wounds works very similarly to regular inkjet printing, which is where the idea stemmed from. "The idea of using printers to make tissue has been around for a long time, but the science was not yet ready for the creation of functional tissues and organs until recently," said Dr. Atala. "For one of our techniques, we use an inkjet printer, but instead of using ink in the cartridge to print on paper, we use cells to print tissues and organs in a three-dimensional shape." The technique starts with drawing the organ or tissue that will be printed using a PowerPoint-like program. The cells that will be used for printing are stored in reserves, not unlike ink cartridges stored in a printer, Atala said. In this particular experiment, a laser scans the wound to determine its size and depth, which creates a map of the wound. A computer then controls the release of the cells from the reserves as they are printed onto the wound. "The wound map is used as a guide so that the correct type and number of cells can be precisely placed on the wound," Atala explained. The guinea pigs of this experiment have only been mice, with similar burn wounds one would see on a person. The researchers look ahead to testing this technology on pigs, which have a more similar skin to humans. Using this bioprinting method, burn wounds on the mice healed in just three weeks, Atala said. Animals that did not receive this type of treatment healed in five weeks. Victims of massive burns tend to die of infection within two weeks unless they receive skin grafts, Reuters reported. Skin cells are taken from several places, Atala said, including cells from the patient, or a skin cell bank or stem cells from amniotic fluid or the placenta. "As we move forward, we’ll be working to determine the most effective source of cells," he said. Atala and his team see this technology doing wonders on the battlefield, when it comes to treating wounded soldiers who often have to undergo painful skin grafting. He pointed out that burn injury is a common cause of death on the battlefield, with 10 to 30 percent of all casualties. "Current treatment options are unable to fully address the needs of combat burn care," he said. "With traditional skin grafts, many burn patients don’t have enough unburned skin to harvest grafts. A new approach is needed immediately to stabilize the wound and promote healing." While no risks have become evident yet, there is still testing and experimenting to be done. The researchers aren’t seeking FDA approval for their technology quite yet, as it is still in the development stage. "Science takes many unexpected turns and twists, some that speed things up and others that slow things down," Atala said. Controlling the way liquids spread across a surface is important for a wide variety of technologies, including DNA microarrays for medical research, inkjet printers and digital lab-on-a-chip systems. But until now, the designers of such devices could only control how much the liquid would spread out over a surface, not which way it would go. "Nobody had really studied this kind of geometry, because it’s hard to fabricate," Wang says. "It’s a big deal to be able to cool local hotspots on a chip," Wang says, especially as the components on a chip continue to get smaller and thermal management becomes ever more critical. The research was funded in part by the National Science Foundation, DARPA, and Northrup Grumman. Mark Shannon, professor of mechanical science and engineering at the University of Illinois, Urbana-Champaign, agrees that this method might be further developed for a variety of applications, including biomedical lab-on-a-chip systems for the detection of specific biomolecules in blood, for example. "Droplet manipulation has been heavily developed for moving samples from station to station for different analysis steps," he says, and this new method might provide a useful way to do that with minimal energy requirements, but to do so will require the ability to create multiple regions on a surface that propel the liquid in different directions for each stage. "This research will help enable these unit operations," he says, in combination with related research currently being carried out in other places. 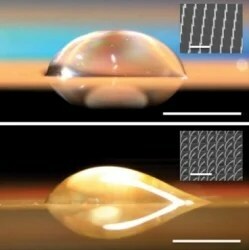 Howard Stone, professor of mechanical and aerospace engineering at Princeton University, who was not involved in this research, says researchers have taken several approaches to surface patterning and control in recent years, some inspired by nature and some by materials applications. "This research advance for one-dimensional asymmetric spreading is a nice addition to the toolbox for surface patterning to control liquid spreading," he says.